I have one simple rule when it comes to purchasing a Workshop on the Go from CTMH: I'd better have lots of ideas of what to do with it once the paper and embellishments are gone. The Blossom WOTG is that kind of set. Here's a picture of what comes in the kit. I can see using those stamps over and over and over again...like this! Below are supply lists broken down by cards (with links for your shopping convenience) as well as instructions that might not be self-explanatory. 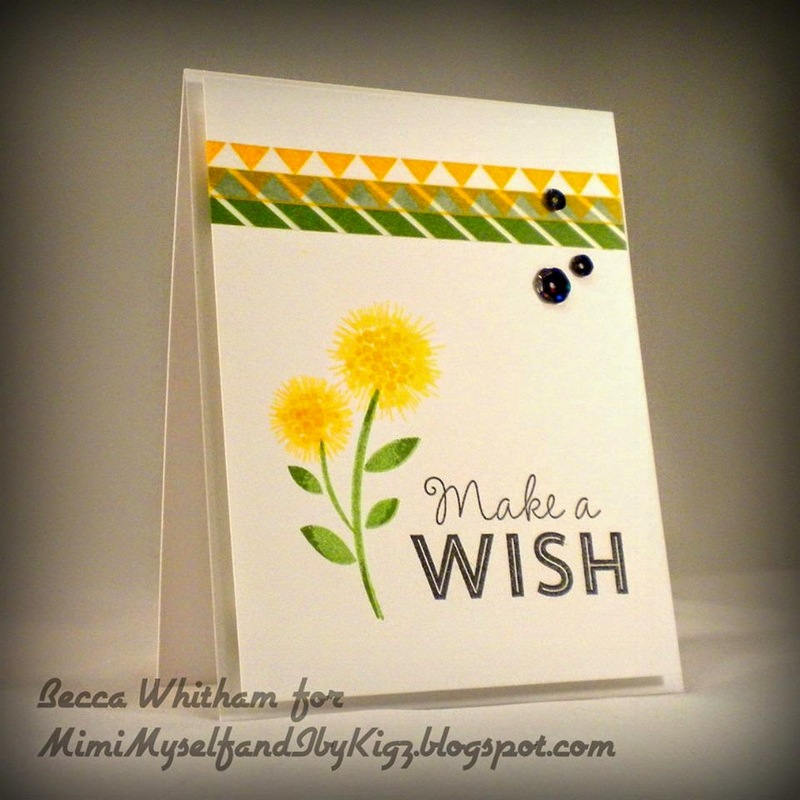 The things you will need for all cards are Blossom WOTG, Foam Tape, and White Daisy Cardstock. I stamped the line flower/circle twice in Canary, rotating a bit between stamping to give the frayed edge look. I used the larger of the two dot clusters to fill in the centers with Canary, and then I stamped in Honey with the smaller dot cluster to add depth. The stem was stamped in Topiary, stamped off on scratch paper, then rolled in Topiary around the edges. Sorry about the photography. I don't understand why it turned out so grainy. This one was pretty easy except for the sentiment. I started by cutting the top panel at 5.5"x4.25". I drew a straight line with a ruler and pencil about 1" from the bottom, stamped the candle in a gazillion colors, cut at the pencil line, and trimmed off about a 1/4" from the bottom piece. I carefully inked just the "YOU" and stamped it on the top panel. Then I carefully inked everything but the "YOU" and stamped it underneath...and then I stamped it again on the shimmer trim to cover up the mess I made. It would have made things easier to cut the stamp in two, but I just now thought of that! Ever since I saw the popsicle stick, I've wanted to create a woodgrain on it using the stamp from the Pathfiding WOTG. If you don't have that set, though, you can still create a bit of texture by using the stamps that come in the Blossom WOTG. On this card, I inked the candle in Cashmere, inked the popsicle stick in Champagne, pressed the popsicle stick onto the inked candle, then stamped. It was a little fussy because both images are so small. The "4 you" tab was stamped on a scratch piece of White Daisy paper. I stamped it leaving about 1/4" of blank space above the straight edge of the image so, when I cut it out, I had space to glue. I used the Sanding kit to smooth down the edges after I cut it out because I can never cut a smooth circle. If you have questions about anything, please leave a comment and then come back for the answer. Novella - 12,850 words written; 7,150 to go. Things are looking up for both characters, but their big crash is coming. Move - we have a pack out date one week after the novella is due. However, we also have stuff getting shipped out in advance that has to be sorted and ready to move sooner. Life in general - finished my last violin lesson on Monday and my second to last lesson at chapel this morning; it's been a joy to teach but I'm ready to have those chunks of time back in my schedule. Right this second - I'm on my second cup of "three bag strong" tea hoping the caffeine will jump start the writing. Have I mentioned I'm trying to use up scraps? This week's challenge over at Heart2Heart is "Anything Goes." With a theme like that, I was encouraged to pull out both old and new to come up with something for a friend whom I'm missing quite a bit right now. Everything is CTMH. The rose and leaves are from an old wood-mounted set that I think is called "Forever Roses." The sentiment is from "Artfully Sent," and the background is "Banner Wishes," both of which are current. The paper is old--really, really old--but still vibrant. It's been fun to mix and match with products from different decades. I have always loved these roses, but it's I've never felt like my coloring did them justice until recently. Non-CTMH stuff is the coloring and accents. I used Copic markers and some corsage pins from Hobby Lobby. New toy alert!! I purchased a camera on a few days ago. With our upcoming move to Alaska, I wanted a good one before we left. We are driving from Oklahoma to Washington to see family then up to Fairbanks. Yep...driving the whole way. 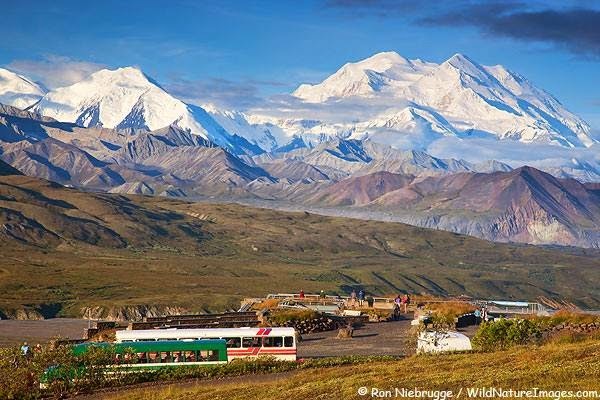 It will take us ten or eleven days with tons of fabulous scenery along the way. That was a good reason, don't you think? Better pictures of my cards is an added bonus! My brother-in-law is celebrating a birthday soon. I combined several challenges to make him a card. I'm not sure if he's a Duck Dynasty fan, but I thought the sentiment was fun anyway. The stamp set is "Here We Go" from CTMH stamped in Momento Tuxedo Black and colored with Copics Y02 and Y08. In addition to being clean and simple, this one was quick and easy! Gotta love that when it needs to get out in today's mail! Shame. It's a powerful tool to modify behavior. The Amish shun. Our forefathers used public stocks. The French sent people to the guillotine. For the rest of us, there's always Facebook. What is it about social media that encourages us to take swings at one another from the comfort of our homes? We talk about cyber bullying like it's limited to teenagers. It's not. This week, I watched a string of comments publicly humiliate people for a choice they made that upset someone. People piled on the condemnation in support of their friend. No one paused to consider their might be two sides to the story. We've taken sides on everything from Miley Cyrus to the Middle East. We've decided innocence and guilt based off sketchy facts. We've debated global warming like the PhD's we aren't. And don't get me started on those political rants. The name calling and spite is vitriolic. All this by people who don't know each other but are willing to tear each other to shreds in what has become America's town square. Before the Internet, before cities became so large you stopped knowing your neighbor, you had to face the people you disagreed with on a regular basis. You knew their children, sat next to them in church, or served on the PTA with them. If you wanted to take a swing at them, there were ramifications to consider before you acted on it. Not any more. Now it's open season. As an author, I'm encouraged to interact with people via social media. Well, this week I wanted to "interact" by reaching through my computer screen, grabbing a couple of necks, and bopping some heads together. Let's get back to basic civility, people. Let's check our facts and our egos. And lets relearn how to discuss issues as opposed to using our opinions like boxing gloves. I do NOT have time to be playing around with card challenges, but the new Runway Inspired Challenge could NOT be ignored!! Plus I got over the half-way mark with my novella that's due June 1, so I deserved a little creative therapy. Right? I used a combination of old and new supplies for this card. I started with Tim Holtz Distress Stain in Broken China. The background stamp is from Stampin' Up! with a copyright date of 2002. I added a little grunge feel with Black Arrow Washi tape from CTMH, some of it colored with Copic markers in B24 and G28. After the Washi tape was down, I used a spritzer to add shimmer tinted water. I dropped, spritzed, whapped, and touched all over trying to get a good reaction, but I think I laid down too thick a layer of the distress ink. The butterfly was cut using CTMH Artiste cartridge. I added gold with a metallic pigment ink to the corners and embossed them with gold detail powder. I then added splotches of more gold by using the direct to paper technique with just the pigment pad. The gold sequins are from CTMH. The sentiment is from CTMH "Banner Wishes" which I attached using yellow tinted staples. This isn't my normal look, but I like how it turned out. However, now I really need to get back to the job at hand which is a birthday card for my son-in-law. Somehow a motorcycle morphed into a butterfly. Hello, my name is Becca Whitham and I'm a paper addict. I save itsy, bitsy, teensy, weensy pieces because I think I'll use them all--someday! Well, with an "overseas" move looming in my future, it's time to start purging scraps. Don't be intimidated by the number of paper packs used on this example. One of the great things about CTMH patterned paper is that they are printed on both sides. You can cut your hexagons, flip some of them over, and you'd achieve the same effect. You'll notice that I wasn't trying to be fussy about lining up the hexagons symmetrically. The scraps which were only small bits required me to use a random approach. Using multiple colors in little bits like this is great for two types of scrapbook pages: 1) where the photo itself doesn't have many colors (like this one), and 2) when there are lots of different colors in your pictures (like maybe a birthday party where your' guests weren't kind enough to wear color coordinated outfits). I actually used up six scraps to the point of having to throw out what was left over. I'm so proud of myself! 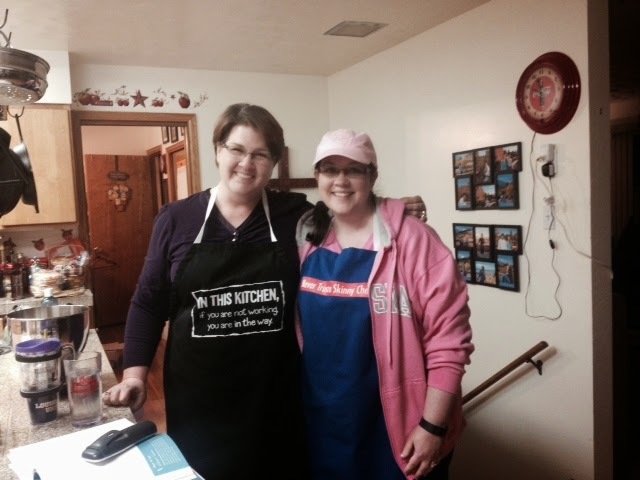 Writer's World Wednesdays - Getting My "Army Wife" On! I've been sitting on some news for a couple weeks, and it's been KILLING me! I couldn't really say much until hubby came home with a Request for Orders, or RFO for those of us army types who know what all the acronyms mean...or at least 10% of them. So...on top of having a novella due by June 1, I have to go get ready for an "overseas" move. I'm starting to hyperventilate just thinking about it. If my blog suddenly goes dark, you'll know why. One of the scary things about getting published is how to market your book. Not my forte. In fact, if I could hole up in my little office and not come out except at feeding time, I'd be almost happy. Fortunately, one of the authors in The Homestead Brides enjoys marketing, so we all piggy-backed off of her efforts. I wanted to make her a set of notecards to say thanks for doing all the work. We hit the Evangelical Christian Publisher's Association top twenty list for two months in a row, at #5 in February (when the book released) and #11 in March. I'm combining two challenges for this card: Heart2Heart (Sketch) and Color My Heart (Brushed paper pack colors). The frame stamp is from Artfully Sent, and the sentiment is from a hostess set that just retired. I need to get these made and out in the mail, but I also need to hole up in my little office and finish the manuscript for the next novella collection I'll be in. Guess I'd better get to work! Some things are worth the wait...like the April Stamp of the Month from CTMH. Every since I got my catalog in August, I've been drooling over this stamp set. Love, LoVe, LOVE it!! I went really basic with my card. The image has so much interest in it that it doesn't require much help. I don't normally do much with the inside of my cards, but I had a little bit of fun with this one. For the paper coming out of the typewriter, I did a few things to add interest. One of the great things about clear stamps is you aren't always stuck with the image as shown. CTMH very kindly left a hole in the stamp where the paper is. This allowed me to bend it into a more interesting shape. It doesn't hurt the stamp; the image will correct back to it's normal shape as soon as you take it off the acrylic block. Here's a close up so you can see it a little better. One of the things you have to watch out for when you bend a stamp is that parts of it can come off the acrylic block and get ink on it. My original intent wasn't to do two sheets of paper, but I ended up with a blob of black ink on the right-hand side of my bottom paper sheet. Working on the premise that almost all mistakes are fixable, I stamped the second piece of paper on a scratch piece of white cardstock, cut it out, used and X-acto knife to cut a slit, and shoved the second piece of paper through. It was a tight fit which caused the top sheet to warp. I put a dot of Liquid Glass over my mess, pressed the corner of the top sheet into it until it held, and Voila! I really, really like how it ended up adding interest and dimension. If you look carefully, you can see where I shaded around the typewriter and paper with the ShinHan marker. I forget where I learned this trick, but adding that "halo" of shading around an image gives it great "pop". The warm grey marker is too intense on it's own, so I scribbled it onto an acrylic block and then picked it up with the colorless blender for that nice, soft shade. One word of caution... Since I used pigment ink on the hand image, I cleaned it by scrubbing it against a pad with little bristles. It's not the CTMH one, but it is made specifically for stamping. The tip of the finger broke off. **Sad Face** Thank goodness CTMH has such a great return policy! I can't wait to scrapbook with this set. I've been holding off doing the pages for signing my book deal waiting to get this set in my inky fingers. Yay!! Someone please tell me I'm not the only one who leaves bits and pieces behind me like breadcrumbs when I go on vacation. A couple weeks ago, I went to see friends in Colorado. I tried to keep all my stuff confined to one area so I wouldn't leave anything when it was time to go. It didn't work. My friends had to send my camera battery charger back to me, but before they did they "decorated" it for me. Now, to truly enjoy the messages, you have to understand the backstory. I met these friends when hubby was deployed. My brain wasn't operating on all cylinders. Or maybe the altitude in Colorado Springs wasn't giving it enough oxygen to function properly. But, whatever the case, every time I went over to their house I left something behind. I left laundry, my phone, and multiple other things. It was quite the joke...and the reason I was so carefully keeping all my stuff together this last visit. The crazy thing is that I looked at the battery charger, recognized it as one very much like mine, and decided it couldn't be mine because: 1) I didn't remember taking it out of my bag and plugging it in, and 2) I never put a label on the end. My friend is always labeling her stuff. Hence, they just had to have the exact same type of battery charger. Why didn't I just ask while I was there? Maybe because my tummy was so full of good cooking that my brain wasn't functioning. Again. Popping in to let you know about an auction to raise funds for the American Christian Fiction Writers Scholarship Fund. I am deeply in debt to ACFW. There's no way I would be published were it not for the people I met and classes I took at their annual conference. I've donated a set of twenty cards to help them raise funds. The bid currently (as of 8:30pm CST) stands at $29. You don't have to be a member of ACFW to bid. Here's my auction item and here's the general auction. If you've ever dreamed about publishing a story, there are several services for editing that just might put your name on the cover of a book. Go. Have fun. Dream. Bid! When you design for someone else, it's important to take into account the things that make them happy. Anyone who's ever visited Amie Kiger's blog knows well that she loves her bling. If something doesn't sparkle, it isn't finished. Using inspiration from finalist #9 in the Top 20 of the 2014 Gallery Idol Competition, I created a card using lots of Washi tape and a blingy (blingey? blingish?) strip of gold trim. To create the Washi covered wedge, I started by cutting the wedge shape from white cardstock and then tore small strips of various colors of tape and wrapped them around the edges if they were too long. My only attempt at doing anything design-like was to try not to put two pieces of the same Washi too close together. I ended with long strips of Black Arrow Washi Tape to highlight the idea of going somewhere. To get my shimmer trim to line up with my Washi covered wedge, I glued the black wedge onto my top card panel, laid down the Washi wedge without gluing, laid a ruler along the bottom edge, removed the Washi wedge, and drew a faint pencil line. I cut the shimmer trim longer than I'd need and line up the edges with the pencil line to affix. The card is for my niece who will be taking a "gap year" after she graduates from high school to visit three different countries for missions. Could the sentiment be any more perfect? I don't think so. This week I got a rejection...a really, really nice one. My writing partner and I put together a proposal for a three-book series and had our agents send it out. One of the publishers took it to their editorial board and, though they all liked the idea, their schedule was full. If we don't sell it in six months, they want us to resubmit it to them. Doesn't get much nicer than that. At least not for a rejection.